This article is about the pigment. For other uses, see Carmine (disambiguation). Carmine (/ˈkɑːrmɪn/ or /ˈkɑːrmaɪn/), also called cochineal, cochineal extract, crimson lake or carmine lake, natural red 4, C.I. 75470, or E120, is a pigment of a bright-red color obtained from the aluminium salt of carminic acid; it is also a general term for a particularly deep-red color. 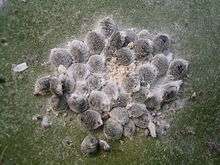 The pigment is produced from some scale insects such as the cochineal scale and certain Porphyrophora species (Armenian cochineal and Polish cochineal). Carmine is used in the manufacture of artificial flowers, paints, crimson ink, rouge, and other cosmetics, some medications, and is routinely added to food products such as yogurt, candy and certain brands of juice, the most notable ones being those of the ruby-red variety. The English word "carmine" is derived from the French word carmin (12 c.), from Medieval Latin carminium, from Arabic qirmiz ("crimson"), which itself derives from Middle Persian carmir ("red, crimson"). The Persian term carmir might come from Sanskrit krimiga ("insect-produced"), from krmi ("worm, insect") (kirm also means "worm" in Persian) The term may also be influenced in Latin by minium ("red lead, cinnabar"), said to be of Iberian origin. To prepare carmine, the powdered scale insect bodies are boiled in an ammonia or sodium carbonate solution, the insoluble matter is removed by filtering, and alum is added to the clear salt solution of carminic acid to precipitate the red aluminium salt, called "carmine lake" or "crimson lake" (the lake here deriving from the word lac, referring to a resinous secretion). Purity of color is ensured by the absence of iron. Stannous chloride, citric acid, borax, or gelatin may be added to regulate the formation of the precipitate. For shades of purple, lime is added to the alum; thus, the traditional crimson color is guaranteed not only by carminic acid but also by choice of its chelating metal salt ion. 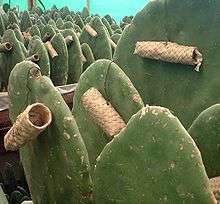 Carmine may be prepared from cochineal, by boiling dried insects in water to extract the carminic acid and then treating the clear solution with alum. Other common substances such as cream of tartar, stannous chloride, or potassium hydrogen oxalate can also be used to effect the precipitation, but aluminum is needed for the color. Use of these chemicals causes the coloring and animal matters present in the liquid to be precipitated to give a lake pigment. Aluminum from the alum gives the traditional crimson color to carminic acid precipitates, which are called "carmine lakes" or "crimson lakes". This color is degraded by the presence of iron salts. Addition of lime (calcium) can give carminic acid lakes a purple cast. A reflectance spectroscopy study of one commercially available dye based on carminic acid found that it reflects mostly red light with wavelengths longer than about 603 nm, which provides its saturated red color. Carmine can be used as a staining agent in histology, as a Best's carmine to stain glycogen, mucicarmine to stain acidic mucopolysaccharides, and carmalum to stain cell nuclei. In these applications, it is applied together with a mordant, usually an Al(III) salt. Carmine was used in dyeing textiles and in painting since antiquity. It is not very stable in oil paint, and its use ceased after new and better red pigments became available. Jacopo Tintoretto used carmine in several of his paintings, including Portrait of Vincenzo Morosini and Christ Washing the Feet of the Disciples. In January 2006, the United States Food and Drug Administration (FDA) evaluated a proposal that would require food products containing carmine to list it by name on the ingredient label. It was also announced that the FDA will separately review the ingredient labels of prescription drugs that contain colorings derived from carmine. A request from the Center for Science in the Public Interest urged that the FDA should require ingredient labels to explicitly state that carmine may cause severe allergic reactions and anaphylactic shock and that it is derived from insects was declined by the FDA. Food industries were aggressively opposed to the idea of writing "insect-based" on the label, and the FDA agreed to allow "cochineal extract" or "carmine". Although concerns over hazards from allergic reactions have been asserted, the FDA has not banned the use of carmine and states it found no evidence of a "significant hazard" to the general population. 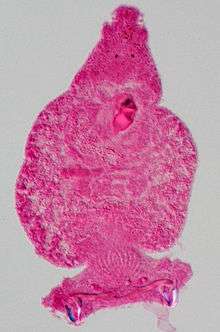 In the European Union, the use of carmine in foods is regulated under the European Commission's directives governing food additives in general and food dyes in particular and listed under the names Cochineal, Carminic acid, Carmines and Natural Red 4 as additive E 120 in the list of EU-approved food additives. The directive governing food dyes approves the use of carmine for certain groups of foods only and specifies a maximum amount which is permitted or restricts it to the quantum satis. The EU-Directive 2000/13/EC on food labeling mandates that carmines (like all food additives) must be included in the list of ingredients of a food product with its additive category and listed name or additive number, that is either as Food colour carmines or as Food colour E 120 in the local language(s) of the market(s) the product is sold in. Although concerns of hazards from allergic reactions were raised, the use of carmine in foods is not banned in the EU. However, the use of carmine in foods has been discouraged by the European Food Safety Authority (EFSA), and, although it is used predominantly as coloring in alcoholic beverages, it can still be found in foods such as supermarket Indian curries. A re-evaluation process of the approval status of several food colors (including carmine) was started by the "Panel on food additives, flavourings, processing aids and materials in contact with food" of EFSA in early 2006 and is scheduled to be completed by 2008. As of January 2012, EFSA has changed the way they allow use of Carmine E120 for pharmaceutical products. The EFSA had raised concerns over the increasing number of allergic reactions to carmine derived from insects (E120.360), when used within the British Pharmacopoeia. Pharmaceutical products which had previously contained insect-derived carmine, have been replaced with a synthesized version of the food colorant. Internal studies have shown that the new formulations of popular anti-nausea and weight-gain liquid medication had a significantly lower risk in terms of allergic reactions. The new formulation is known to be of plant origin, using calcium oxide in order to gauge color depth. 1 2 Dapson, RW; Frank, M; Penney, DP; Kiernan, JA (2007). "Revised procedures for the certification of carmine (C.I. 75470, Natural red 4) as a biological stain". Biotechnic & Histochemistry. 82 (1): 13–5. doi:10.1080/10520290701207364. PMID 17510809. ↑ Greenhawt, Matthew; McMorris, Marc; Baldwin, James (2009). "Carmine hypersensitivity masquerading as azithromycin hypersensitivity". Allergy and Asthma Proceedings. 30 (1): 95–101. doi:10.2500/aap.2009.30.3199. PMID 19331724. ↑ Mackenzie, D. (1971). A Concise Pahlavi Dictionary (p. 50). Oxford University Press. ↑ Mackenzie, D. (1971) A Concise Pahlavi Dictionary (p. 51). Oxford University Press. ↑ "Online Etymology Dictionary". Etymonline.com. Retrieved 2013-10-04. 1 2 "Important Dates in Fabric History". Time Line of Fabric Information. Threads In Tyme, LTD. Archived from the original on 2004-08-23. ↑ "E-numbers : E120: Carmine, Carminic acid, Cochineal". Food-Info.net. Retrieved 2013-10-04. ↑ Bisulca, Christina (2008). "UV-Vis-NIR reflectance spectroscopy of red lakes in paintings" (PDF). 9th International Conference on NDT of Art. ndt.net. Retrieved 2013-06-19. ↑ Schweppe, H. and Roosen-Runge, H. Carmine – Cochineal Carmine and Kermes Carmine, in Artists’ Pigments. A Handbook of Their History and Characteristics, Vol. 1: Feller, R.L. (Ed.) Oxford University Press 1986, p. 255 – 298. ↑ Plesters, Joyce (1980). "Tintoretto's Paintings in the National Gallery". National Gallery Technical Bulletin. 4: 32–47. JSTOR 42616257. ↑ Greig, J. B. "WHO FOOD ADDITIVES SERIES 46: COCHINEAL EXTRACT, CARMINE, AND CARMINIC ACID". Food Standards Agency. Retrieved 2010-09-02. The nature of the adverse reactions, e.g. urticaria, rhinitis, diarrhoea, and anaphylaxis, provides clear evidence that systemic reactions can follow exposure of a sensitized individual to cochineal colours. 1 2 Tabar, A.I. ; Acero, S.; Arregui, C.; Urdánoz, M.; Quirce, S. (2003). "Asma y alergia por el colorante carmín" [Asthma and allergy due to carmine dye]. Anales Del Sistema Sanitario De Navarra (in Spanish). 26 Suppl 2: 65–73. doi:10.4321/S1137-66272003000400009. PMID 13679965. ↑ "FDA Urged Improve Labeling of or Ban Carmine Food Coloring". Cspinet.org. 1998-08-24. Archived from the original on 2013-10-02. Retrieved 2013-10-04. ↑ "Bug-Based Food Dye Should Be ... Exterminated, Says CSPI". Cspinet.org. 2006-05-01. Retrieved 2013-10-04. ↑ "Guidance for Industry: Cochineal Extract and Carmine: Declaration by Name on the Label of All Foods and Cosmetic Products That Contain These Color Additives; Small Entity Compliance Guide". Color Additives. FDA. April 2009. Retrieved Dec 19, 2012. ↑ "FDA: You're eating crushed bug juice". Archived from the original on 2006-02-10. ↑ "Food Additives in Europe". Foodlaw.rdg.ac.uk. Retrieved 2013-10-04. ↑ "Archived copy" (PDF). Archived from the original (PDF) on 2007-01-23. Retrieved 2007-01-02. ↑ "European Parliament and Council Directive 94/36/EC of 30 June 1994 on colours for use in foodstuffs" (PDF). Food Safety authority of Ireland. Retrieved 2013-10-04. ↑ "Food Standards Agency - Current EU approved additives and their E Numbers". Food.gov.uk. 2012-03-14. Retrieved 2013-10-04. ↑ "Archived copy" (PDF). Archived from the original (PDF) on 2006-12-08. Retrieved 2007-01-02. ↑ "Archived copy". Archived from the original on 2007-01-08. Retrieved 2007-01-02. Accessed on 2 January 2007. ↑ "Archived copy" (PDF). Archived from the original (PDF) on 2007-07-04. Retrieved 2007-01-02. This article incorporates text from a publication now in the public domain: Chisholm, Hugh, ed. (1911). "Carmine". Encyclopædia Britannica (11th ed.). Cambridge University Press. Greenfield, Amy Butler (2005). A perfect red: Empire, espionage, and the quest for the color of desire. New York: HarperCollins. ISBN 0-06-052275-5.